Tree removal cost information. 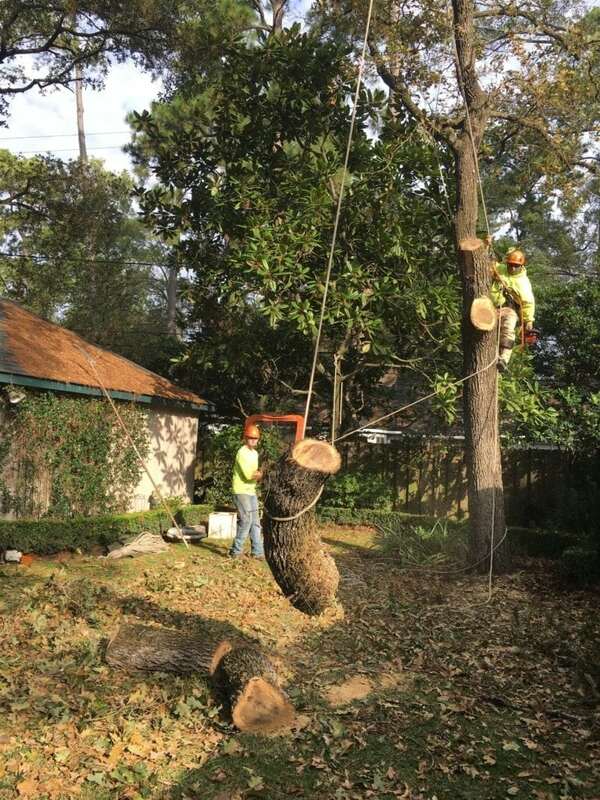 Determine cost to remove a tree in Houston. Home » Tree Removal » How much does tree removal cost? Tree removal is a complex process often involving a lot of risk. To perform tree removal safely it is necessary to have the proper equipment and a crew that has specialized training. Cost to remove a tree can vary greatly depending on several factors. Provided is some helpful information to answer your questions about the process of determining tree removal cost. It is virtually impossible to estimate the cost without seeing the tree in person. Due to this, professional tree services typically offer free estimates. Below are the main factors that an estimator will use to determine the cost of tree removal. A firm bid in writing from a professional tree service is the best start to any tree removal process. Size of a tree will play a major part in the overall price. Regardless of other factors size of the tree will be used to determine how much debris will need to be hauled away and provide a general idea of how long the job should take. Small trees are those that are about 8 inches in trunk diameter or less, and up to 15 feet tall. They generally can be removed with little to no climbing and no complex rigging. Because of their smaller size these trees can generally be removed by someone with less skill. In this instance, the majority of the work would go to haul off and cleanup rather than the removal itself. Medium trees cover a wide array of trees in the urban setting. They are the ones that have been growing in neighborhoods for 10-20 years and may be just starting to outgrow their space or become a nuisance. Medium trees are generally about 10-15 inches trunk diameter and can be up to 25-30 feet tall. Medium trees require more labor and disposal cost than small trees and in some cases require light rigging to safely remove. Cost to remove a medium tree can vary quite a bit depending on size and complexity of the tree removal. Large tree removal costs the most for obvious reasons. They often tower high in the skyline and have large branches that extend out over houses and other objects making their removal much more difficult. The cost of large tree removal can be more expensive simply because they require lots of technical rigging to safely bring down branches. As well as the shear volume of debris created. If you have a large tree on your property that needs to be removed it is best to contact a professional tree service. Large tree removal is a hazardous task not suited for the average person. Large trees pose the greatest threat to your home and should be evaluated for safety. If you are considering the cost of large tree removal this would be a good time to have a certified arborist out to your property to evaluate all of your trees. 3. Location of tree being removed on your property. Location of a tree can influence the cost of tree removal almost as much as the tree’s size. If a tree is located far to the rear of a property, or where access is limited, it can greatly increase the time and complexity of the job. The cost to remove a tree that is a bit larger but located near the street can be removed more quickly than a medium tree located at the rear of the property. Location affects the cost to remove a tree in ways that may not be apparent. Such as increased cleanup time due to the tree being located near a pool or over property lines. These are all factors that you should consider before talking to tree services in your area. When getting estimates it is important that your tree removal cost includes time for not only safe removal of the tree but for proper cleanup as well. Removing a tree near structures. In urban areas trees have limited room to grow and are often sandwiched into small yards or easement areas. As they grow, larger trees can span over structures and crowd into high voltage power lines. Where structures are concerned tree removal cost generally goes up due to the additional rigging lines and skill sets needed. Also, the tree service is assuming more risk when removing trees near structures. 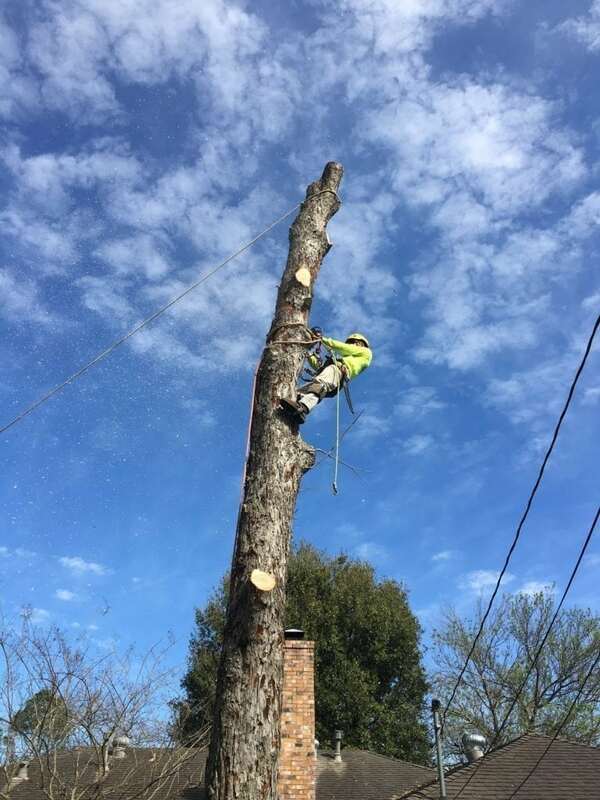 If you are considering tree removal near a structure you want to find a company that is fully insured and knowledgeable enough to get the job done safely. The right company for the job will not always be the cheapest company. You should take extra care when evaluating the cost of tree removal near structures. Tree removal near underground utilities, sprinklers or plumbing. The cost of tree removal involves more than avoiding objects above ground. In determining the cost to remove a tree your estimator must also take below ground items into account as well. Underground utilities can be especially tricky because they often cannot be readily seen. Tree removal often involves dropping large logs and or felling of tree stems. In an open area this can be done safely and an estimator may not be fully aware of what risks lurk underground. Underground natual gas lines including those to outdoor stoves and lanterns. Water lines to your house. Sewer lines away from hour house. Plumbing and wiring associated with pools. 4.Condition of tree being removed. How much tree removal costs can also vary with the overall condition of your tree. If your tree is perfectly healthy the limbs have more strength and can be safely used for rigging large sections of wood. On the other hand if your tree’s condition is not good there may be decay present causing limbs to be weak. An arborist or estimator will take the condition of your tree into account when determining the overall costs to remove your tree. If you are interviewing tree services to find the cost of tree removal then you should ask each one about the condition of your tree. A reputable company will be able to explain to you how your tree looks and if the structure is sound. They should be able to point out areas of concern and explain why they can or cannot use certain areas for rigging large loads. Better condition allows the estimator to trust the strength of your tree’s wood for normal rigging. If your tree’s condition is poor the estimator may need to include additional costs for more advanced techniques, making smaller cuts or utilizing equipment such as a crane. Not including the proper costs and equipment could lead to an accident so make sure to discuss tree condition when getting estimates. 5.Complexity of cleanup can effect tree removal cost. Proper clean up takes time! If you want your property to look good following a tree removal it is best to make sure that cleanup is included in the tree removal cost. One of the ways you can negotiate for a lower price is to specify a lower level of cleanup allowing you to do some of the work yourself. The important thing is to discuss this when getting estimates for tree removal. If your tree is located near a pool or property line there may be significant costs for the tree service to clean your property and your neighbors property. Sometimes large tree removals near corners of the yard will end up with debris over three or more properties. You need to make sure that your neighbors property is clean after the tree removal is complete. The cost of your tree removal should not include angry neighbors so make sure to get cleanup details in writing! I left a message too, but we would appreciate someone coming out to look at removing a massive pecan tree from our yard. There is a crack in the base of the trunk and would like it removed. After examine just a few of the blog posts in your website now, and I truly like your approach of blogging. I bookmarked it to my bookmark web site checklist and will likely be checking again soon. Pls check out my website as nicely and let me know what you think. Thanks for giving us an idea on how much a tree removal would cost! I have a tree where it’s branches intersects with a powerline, when it storms, the branches violently sways the powerline, so I’m going to have it remove. The tree is quite a size, I’m guessing it called fall into the category of a medium size, at least, I have an idea how much would it cost.